1 Preheat oven to 425°F. Put a 10-inch cast iron skillet into the oven and heat for at least 8 minutes. 2 Melt 3 tablespoons of butter in a saucepan or in a microwave. Of the 3 tablespoons, one tablespoon will be for the batter and two for the pan. 3 In a blender, put the eggs, egg white, milk, 1 tablespoon of the melted butter, sugar, flour, vanilla, cinnamon, and salt. Blend until you have a smooth, creamy batter. This should take about 30 seconds. Be sure to scrape down the sides of the blender carafe with a rubber spatula if necessary. 4 Carefully remove the very hot skillet from the oven. (Watch out, the handle is HOT! Make sure to use a thick pot holder so you don’t burn your hands.) Pour the remaining 2 tablespoons of melted butter in the pan and swirl to coat the bottom of the pan. Gently pour the batter into the hot skillet, making sure not to splatter batter all over the sides of the pan. Put in one cup of fresh raspberries. Carefully return the pan to the oven and bake for 20 minutes. 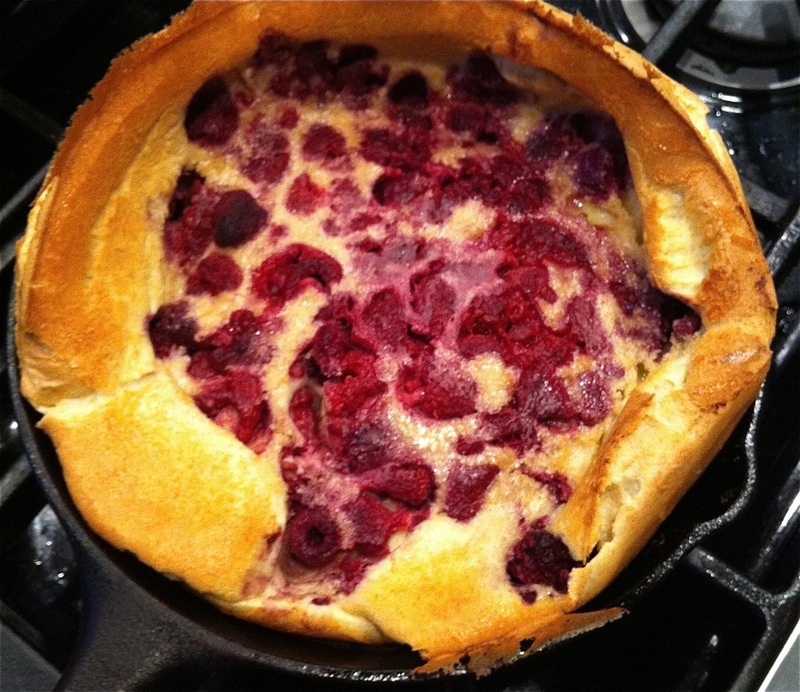 The Dutch baby will puff up around the edges, even to the point that the sides will obscure the center. It’s a wondrous sight to behold when watching through the oven window! Do not open the door to peek, though, as opening the oven door even a crack while baking may cause your Dutch baby to fall. 5 Once the Dutch baby is done baking, remove the skillet from the oven (again, take care, the handle is HOT) and use a thin spatula to gently coax the pancake onto a large plate. It may fall slightly once removed from the heat, which is totally normal. To serve, cut into wedges and sprinkle with powdered sugar (and more cinnamon if you wish) and a splash of lemon juice. Yield: Makes 1 10-inch Dutch baby pancake. Feeds 2 or 3 people for breakfast.